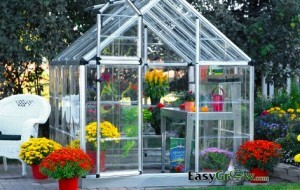 It seems like there is a little bit of confusion when it comes to what exactly is a portable greenhouse. I see quite a few greenhouses advertise as portable greenhouses, and I guess technically they are if you consider picking it up and now putting in a trailer and moving it with 4 to 8 people is truly portable. For example, I moved a 6×8 wooden greenhouse from one home to another, so technically it was portable – but it took a very large bribe of pizza and sodas and all of my kid’s high school friends and any of our staff that I could coerce to pick that sucker up and lifted up over a fence, tie it down on a trailer and haul it down the road and do the reverse of that once we got there. So for this discussion I don’t think we’ll consider the fact that you can move greenhouse makes it truly portable. When I think of portable, I think of something that you can pick up by yourself, carry it out to where you want to build it and easily do so. It should also be easy to take down and store whenever you don’t need it. Now that cuts down the amount of truly portable greenhouses by a very large factor. In fact out of all of the greenhouses that we carry I believe that the flower house portable greenhouse line is our only true portable greenhouse. The bigger question might be, why use a portable greenhouse. Portable greenhouses are usually not well insulated, if you think about it is pretty easy to see why since they have to be folded up and put away when you’re not using them. This limits when we can use the greenhouse; basically we can use it for early starts or keeping the frost off a late crop. Most portable greenhouses are 4 to 8 foot wide and 6 to 8 foot long so you’d need a fairly small area that you want to set up a portable greenhouse. If you had a small flower bed you can set the greenhouse up the spring for an early start. Just think about how warm it gets in your vehicle when the sun is shining and you can see how it will warm up a bit during the day but of course once the sun goes down it only function will be keeping the frost off of your plants. Of course that alone can make all the difference in the world to your plants. Come summertime these greenhouses could still be used since some even have ventilation, the flower house does. But for the shading and ventilation that you would need to truly use the greenhouse in the summer you may find a portable greenhouse is not the right choice if that’s what you require. The same goes for winter. A portable greenhouse is basically going to be worthless in the winter. It’s lack of insulation and structural stability means it won’t give your plants much protection and may not survive the winter. Most of our customers find using its truly portable capabilities and just packing it away for the winter is the best choice.